Hotel registration deadline was April 6th to receive discounted rates. Still accepting workshop registrations. Late registration fees will apply after April 14th. 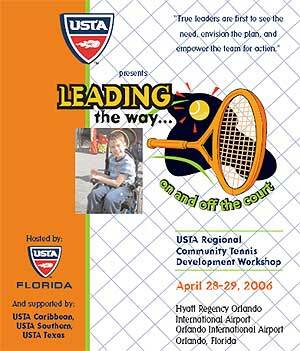 Don’t miss the USTA Regional Community Tennis Development Workshop scheduled for April 28-29, 2006, at the Hyatt Regency Orlando International Airport in Orlando! This workshop offers CTA leaders, volunteers, staff, and local tennis enthusiasts the essential tools that will assist them as they lead their organization in the future. Experts in the fields of fundraising, advocacy, board development, diversity and more will provide valuable information for leaders to take back to their community.